It’s raining. Cape Tribulation has a beautiful beach, fringed with palms. The clouds are grey and the waters dull in the gentle light. We run from the car in the rain, but do little more than glance at the beach before we are on our way again, on to the Bloomfield Track. The gravel track is steep. Sharp climbs and rocky creek crossings provide our first driving challenge of the trip. The track follows the coast along the edge of the Daintree Rainforest. Tropical Tarzan vines hang down over the road and tangle around fan palms and tree ferns. We speed over the track, as fast as the landcruisers will carry us. Not everyone who passes by values the rainforest. It’s sad to see styrofoam food containers and aluminium drink cans lying on the roadsides. We stop at an indigenous art gallery for coffee and a browse. The art is not as impressive as the nearby waterfall, thundering down on the rocky river bed. Further along the track, misty mountains rise up ahead of us. They create the heavy rainfall, about 7 metres a year, that is needed to sustain the Daintree rain forest. Lunch is at an old hotel with a long history, named The Lions Den. It’s been a watering hole since the 1800s. Check out the car park these days and it’s full of four wheel drive vehicles. Like many outback pubs, the walls are covered with the names of past customers, backpackers and campers. Is there a need to make a mark? To be part of a travelling tribe? How many return to find the names they scrawled years ago, to touch their youth? On again. Next stop Cooktown. This is where Captain James Cook landed to repair his damaged ship, back in 1770. 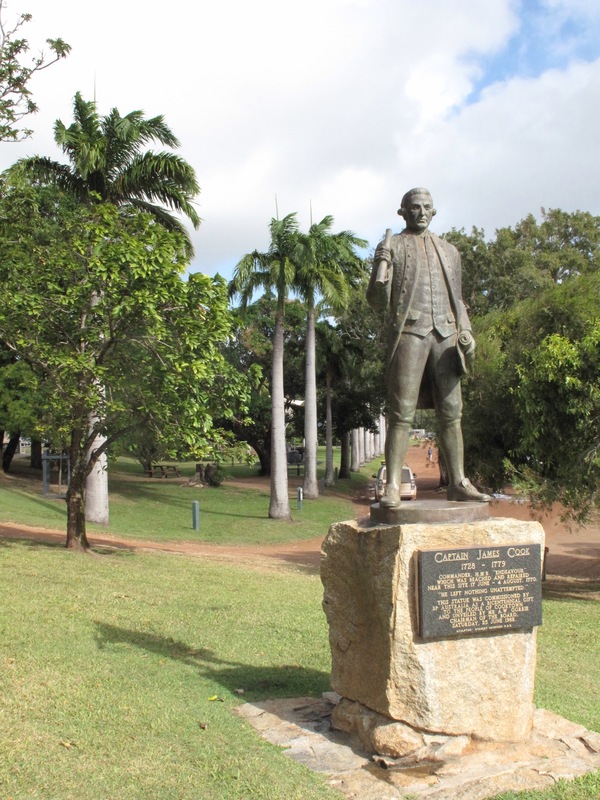 There are memorials to Cook, including a life size statue on the waterfront. The town grew to a major centre when gold was discovered on the Palmer River, but has now become a pleasant, but overlooked backwater. Who knows, it’s time may come again. At the end of the day we drive to Endeavour Falls to camp overnight underneath the palm trees. This entry was posted in Australia, queensland, travel and tagged Australia, cooktown, Outback, queensland, Travel on 14/06/2015 by Deb McSephney.